Plenty of people don’t like to cook. And even among those who do, not all of them have the ability to do so. According to recent data from YouGov Profiles, nearly three in 10 US adults aged 18-49 who enjoy cooking feel they don't have enough time to cook for themselves. Add to this that 42% of 18- to 49-year-olds in general think grocery shopping is boring, and it’s not difficult to see why easy-to-assemble meal kit delivery services have begun entering the nation’s kitchens. 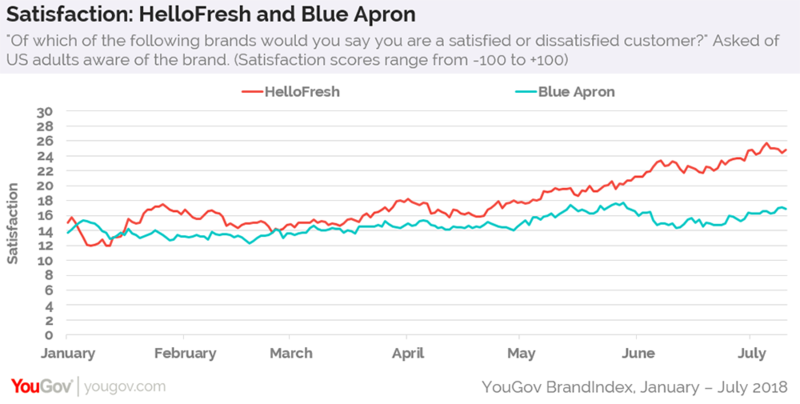 As various meal kit startups attempt to expand awareness and increase subscriptions, new numbers from YouGov BrandIndex reveal that Germany’s HelloFresh has started to pull away from American rival Blue Apron on a couple metrics. The first is YouGov’s Impression score, which asks respondents if they hold an overall positive or negative impression of a particular brand. 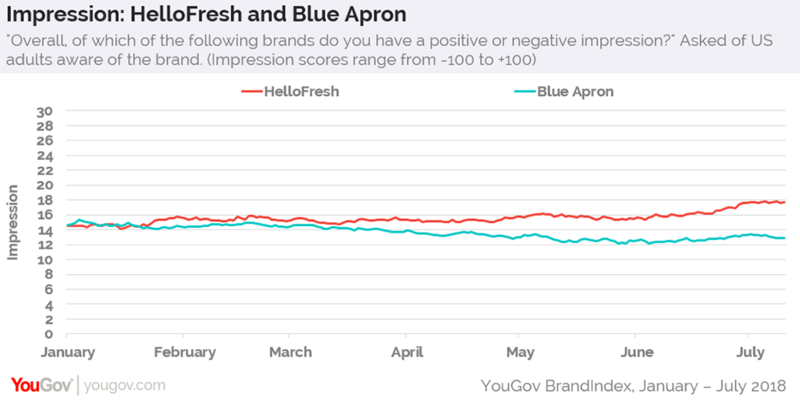 Since January 2018, HelloFresh’s Impression score among those aware of the brand has climbed from 15 to 18. Blue Apron, on the other hand, has decreased from 15 to 13, creating a 5-point gap between the two meal kit companies. The second metric addresses the growing difference in customer satisfaction. Figures show that HelloFresh’s Satisfaction score has recently reached a peak of 26. Blue Apron, meanwhile, has yet to hit a score of 18 this year. Additional data from YouGov Profiles suggests that 55% of consumers who have a positive impression of HelloFresh tend to bring lunch from home to work. The same is true for 43% of US adults who hold a favorable view of Blue Apron. Furthermore, 51% of HelloFresh fans don't mind paying more for organic food, compared to 46% of consumers who hold a positive impression of Blue Apron.